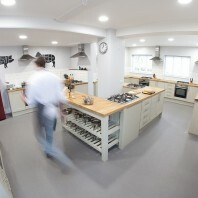 Basic ingredients: Lewis Davies showed his flair for property development when he took a disused pub in the Surrey Hills and transformed it into the professional and elegant premises of the Abinger Cookery School. Head chef/tutor Vincent Clist was swiftly recruited, bringing with him his knowledge of global gastronomy and the accolade of Times Chalet Chef Award 2010, after teaming up with gourmet chalet holiday specialists, Fish & Pips. This union forms the bedrock of Abinger’s signature five-day chalet course. Chalet Cooks – Week 1 runs throughout the year, mainly during school holidays, priced at £695 in the low season and £795 in the high season with accommodation offered at £25 per person per night. Once there, students undergo an intensive programme that includes knife skills, menu planning, sourcing ingredients, budgeting and time management; living in an environment where they will learn to host as well as cook. Week 2 is an extension that provides more opportunities for jobs in the Alps via the school’s links to companies in the ski industry. In addition, Abinger also runs two-day courses on basic and advanced cookery, both cost £450, and pastry, priced at £250. Single-day courses are £135 and include themes such as The Perfect Roast, Best of British, Seafood Secrets and the zeitgeisty Dude Food; as well as skills-based pasta and butchery lessons. They say: The Abinger team love food and look forward to passing that love on to you. Our courses are hands-on, practical, inspired and most of all fun! We say: Being in the heart of the outstanding Surrey Hills is about as close as you can get to recreating the Alps experience in Southern England. What’s more it’s less than an hour from London so perfect for the weekend combined with walks, cycling and village teas. The 18th-century inn has been refurbished to a high standard with four smart “farmhouse-style” rooms for B&B. Many smaller cookery schools are run by just one person wearing many hats – Davies, however, has wisely chosen to assemble a small team of experts around him, each playing to their strengths. As such, guests are in good hands. For example, an upcoming class features award-winning chef Adam Byatt demonstrating how to pull off a four-course gourmet dinner party.